If my memory serves me well, it was August 1995. It was then called the Sheares Bridge Run, also organised by the Army with the same categories, 21km, 10km and 5km. The highlight then was all runners, including the 5km category, had to run up Sheares Bridge (hence the name) and back along Nicoll Highway. I will always remember that first 1km stretch of torturous climb. After 21 years, my running has come of age and reached full circle. This year, at the SAFRA Singapore Bay Run & Army Half Marathon (SSBRAHM), I celebrated a special occasion. I was back to running the 5km to commemorate my running journey since the first race in 1995. The logo below, which has been used since, depicts a man running over Sheares Bridge (in case you don’t know.) But gone are the days of having to run up the bridge but instead we are blessed with a relatively flat Marina Bay area for this event. Since 1995, I have not done many races. A couple of years thereafter, I had a fall and injured my foot, leading to plantar fasciitis plaguing me for years before I dared to run again. My physiotherapist, who was a runner, then told me that my recovery would depend very much on my diligence to work through the therapy. I guess I was either too lazy or ill-disciplined to see myself through that. Since then, I never quite came back to running till about ten year later. Then in 2005, I started to experiment with short runs, but no more than 2.4km thinking that it would be enough to stay fit and healthy. Also, then I did not have the time to go for long runs – juggling the demands of family and work. All these short runs were enough to satisfy me until I turned 55, and that’s when I thought of doing something different – so much for midlife crisis. 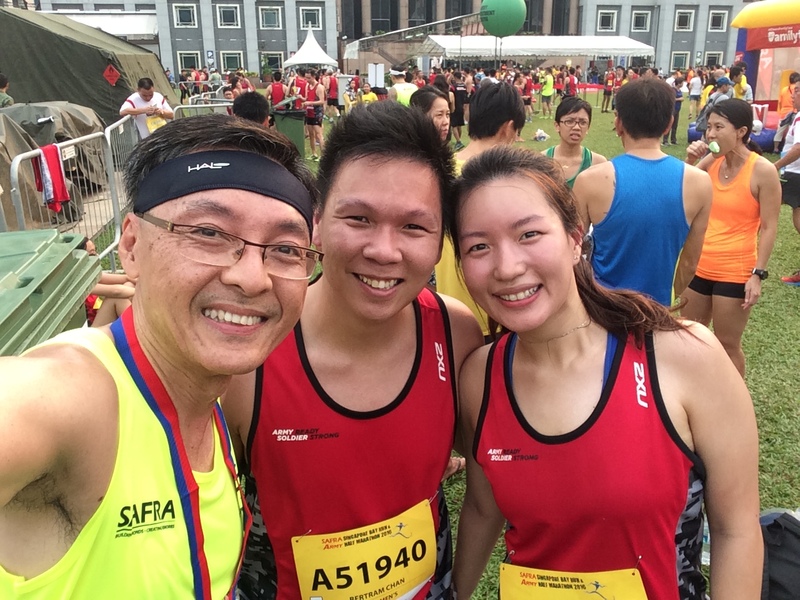 In 2014, I ran my first 10km at SCMS2014 and in Nov 2015, I ran my first 21.1km. See my first blog here (comments are welcome). And since 2014, I had gone on to run more than 15 races and even lucky enough to podium once! 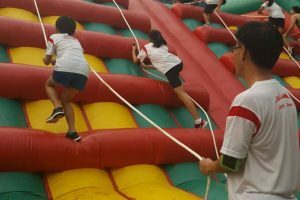 I was busy chasing personal best timings and amassing medals and finisher tees that I lost my original aim of running – to run for fun and fitness. 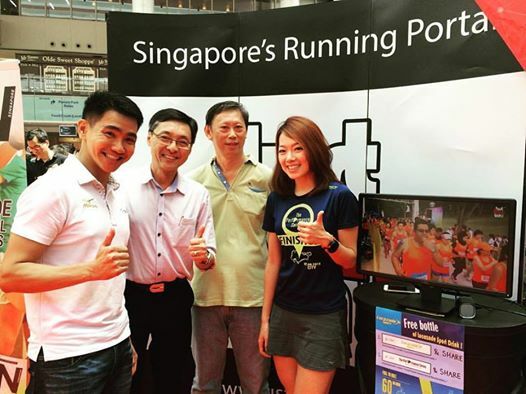 The wake up call came in April this year, just right after my NTUC Run350 half marathon. My knee gave way and I was not even be able to run even 1km without any pain. And so I began my long journey of recuperation and recovery from runner’s knee. What happened during that period will be left for another blog. Four months have past since I hurt my knee. Throughout that period, in order to stay active, I did a lot of strengthening and stretching to rehabilitate my knee coupled with a few 5km races that I only managed to jog and walk. You can read some of these in my previous race reviews of OSIM Sundown and Pocari Sweat. 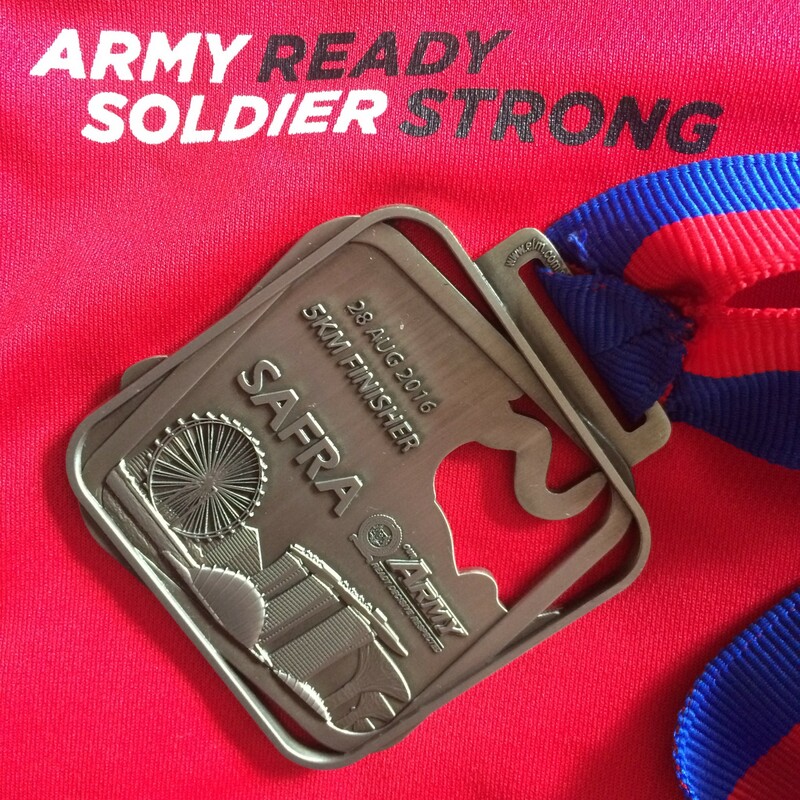 Long before I had this injury, I was already eyeing the Army Half Marathon because of its significance to me. Alas, I could only choose the 5km category so as not to further aggravate my injury. 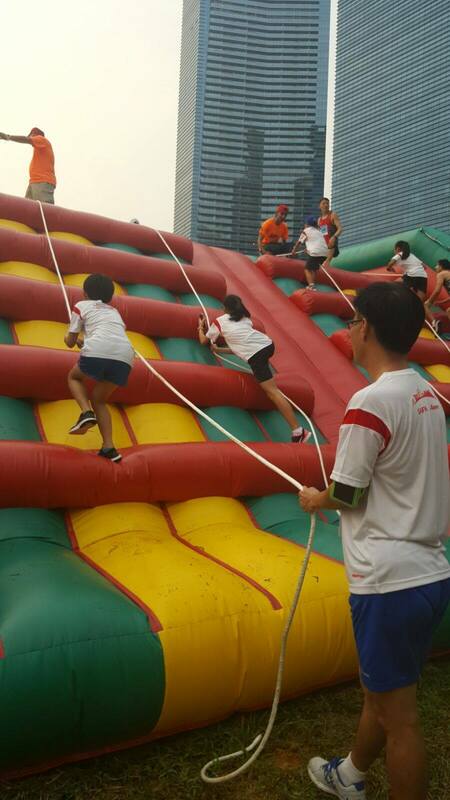 Nevertheless, I am still happy to join the hundreds of NSmen and army personnel and their families for this fun run. I woke up very early on that race day morning and was already at the starting point around 7am (when my flag off was only at 8am). I saw wave after wave of red filing past me as they made their way to the starting point – which made me a bit nervous about the run. 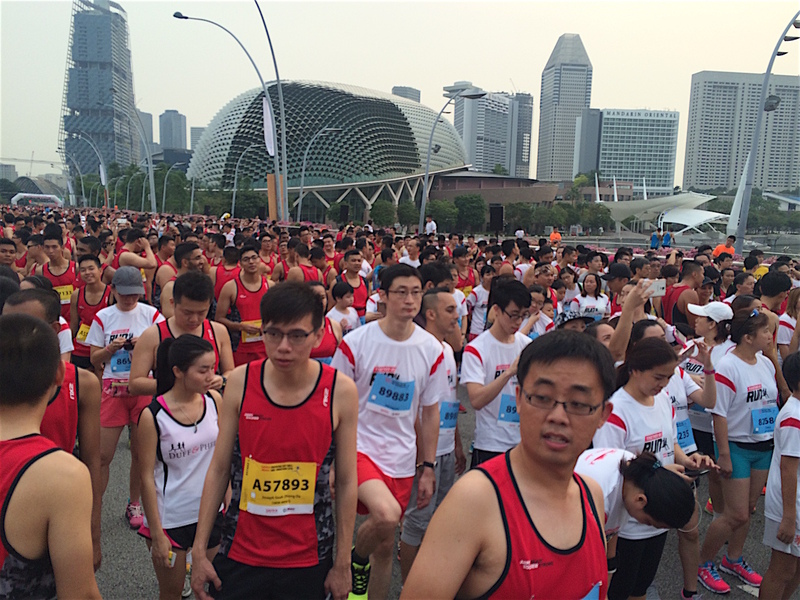 Recalling the 1995 event, I cannot remember if there were so many people running at the same time; even for the 5km. While waiting for the 5km to be flagged off, I found the entire atmosphere very different from the competitive 10k and 21.1k categories which I used to participate. Runners lining up were generally more relaxed. Many were accompanied by their children and wives or partners (I’m being LGBT sensitive hehe). 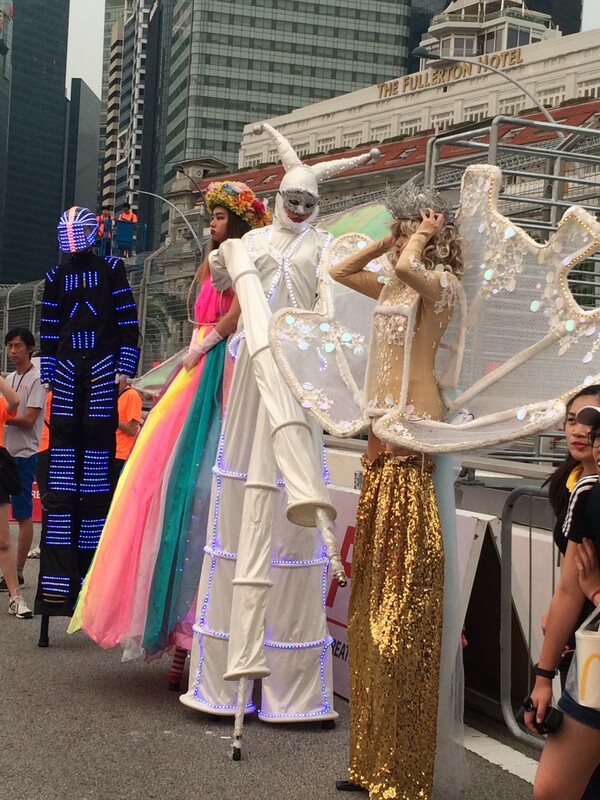 The cosplay stilt walkers added to the carnival mood and there were a bunch of seniors right at the front row of the starting line. 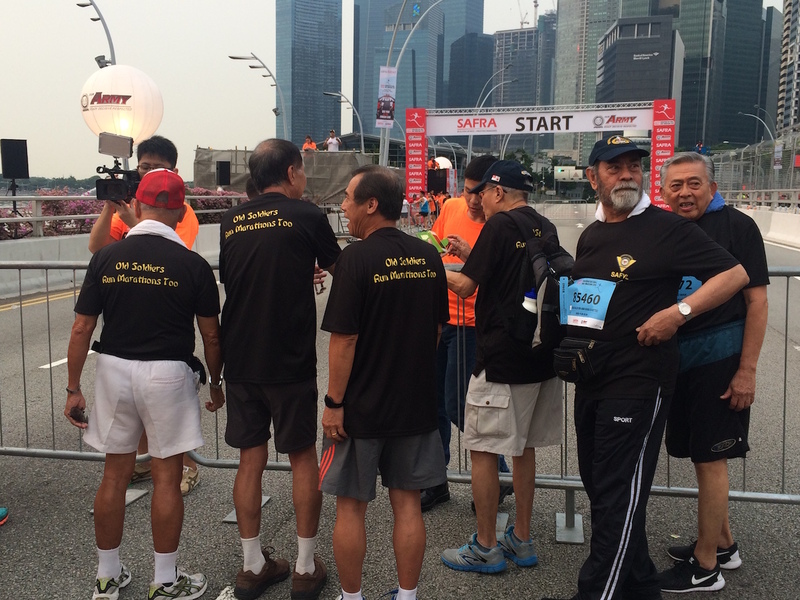 Such an inspiration to see these old uncles donning their gears and lacing up their running shoes to join the fun. Kudos to them; even the 5km seemed like a marathon to them! Old Soldiers Run Marathon too! At 8am sharp, we were flagged off by Acting Minister for Education, Mr Ong Ye Kung. He waved and said hello to one of these old guards. Apparently they knew each other from before. Although it was a fun run, I was left in the dust barely 50m from the horn, with some uncles and young kids way ahead of me. Smiling to myself, I just let them each overtake me and before long, the lead runner was out of my sight. The route took us through Esplanade Bridge and towards Shenton Way and snaked back to the Promontory where a surprise awaited all of us. 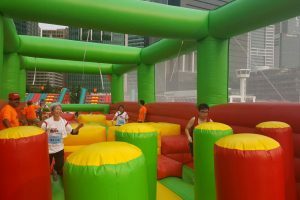 When we past One Marina Boulevard building and hit the grass batch at the Promontory, I heard “Red tag keep left, Blue tag keep right!”; signaling all the fun runners to make their way to the two inflatable obstacles. Wow! What a fun way to run the 5km and celebrate my coming of age with regards to running. Climbing up the Apex Ladder was relatively easy and it was to be done on all fours; and when I reached the other side all I needed to do was to slide down (which was quite fun). I wished there were more photographers on site to capture the fun moment of an old uncle going down an inflatable slide! These two obstacles were inspired by the Standard Obstacle Course that every army recruit has to go through. In my NS days, it was called Jacob’s Ladder. However, the Rubble was non-existent in those days. Navigating the Rubble was not easy, if you want to do it fast. A few of the NS boys fell and tripped, being not used to the soft rubber. For me, I just took my time to get through it; but then it also disrupted my pace. I tried to find my rhythm again but it was painfully difficult. Clearing the obstacles disrupted my breathing pattern and my running gait. 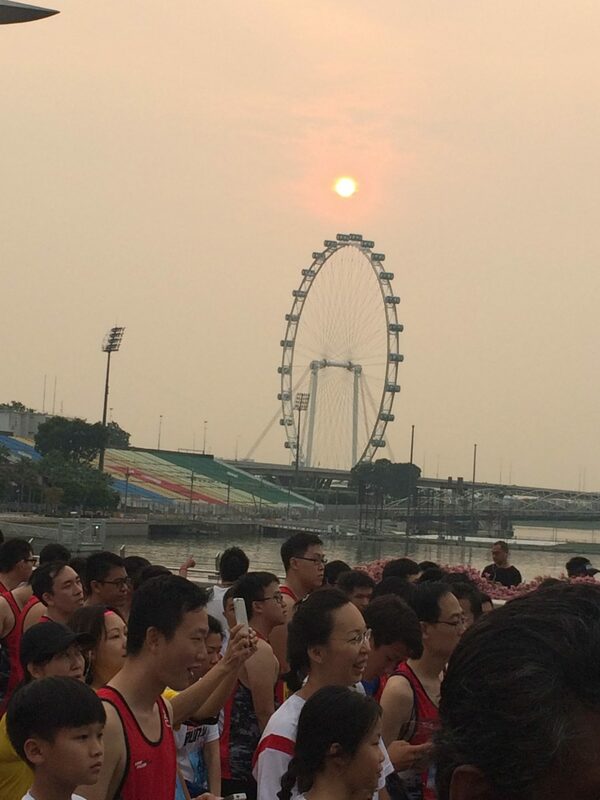 So I gave up thinking about it and just enjoyed the Marina Bay scenery. I ran past the DREAM sign and thought about how my dream of running again has come true (after my injury.) Picking up a drink and downing it very quickly, I went along my way. Going past the Marina Bay Sands, I thought about those runs I had at the Bay; often tempted to run into the coolness of Marina Bay Shoppes each time I ran by that place. Hitting the Helix Bridge meant that I was almost half way through the run. I found my rhythm again. As I came down from the bridge, I was met with a rude shock. The 5km route converged with the other category routes. When two streams of human traffic merged, there was much jostling and everyone was trying to find some space to run. It was one huge human-traffic JAM! It continued to be packed with runners all the way to the Padang. I had to weave my way through the half-walking, half-jogging runners to ensure that I did not break my rhythm again. The crowd began to thin out after Anderson Bridge and the different categories were funneled into different channels to collect their drinks, medals, etc. I saw the digital clock ticking away at about 30:45 and I knew I wasn’t going to do less than 31mins. If not for the delay at the inflatable obstacles, the subsequent loss of pace and the jam at the last 1-2km, I would have been able to achieve my targeted 30min. Since this was supposed to be a fun race and I was still in recovery mode; it doesn’t really matter. Still I was happy that I could achieve such timing. Crossing the finishing line, I picked up the medal and made my way to find some friends. The entire Padang was swarmed with so many runners, many of them from the 10k and 21.1km categories and it was impossible to locate any friendly faces. When I was about to give up, I heard someone calling “Mr Chia”. I turned and saw one of my ex-students, Bertram who just finished his 10km run with his fiancée. What a nice way to bond their relationship. After taking a wefie with him and his fiancée, I cooled down, stretched a bit and started to head home. While I was walking to the Raffles Place MRT, a thought came to me. How nice it would be if I had run the 21.1km to mark this 21st anniversary of my SAFRA Sheares Bridge Run. But it was just a fleeting thought. 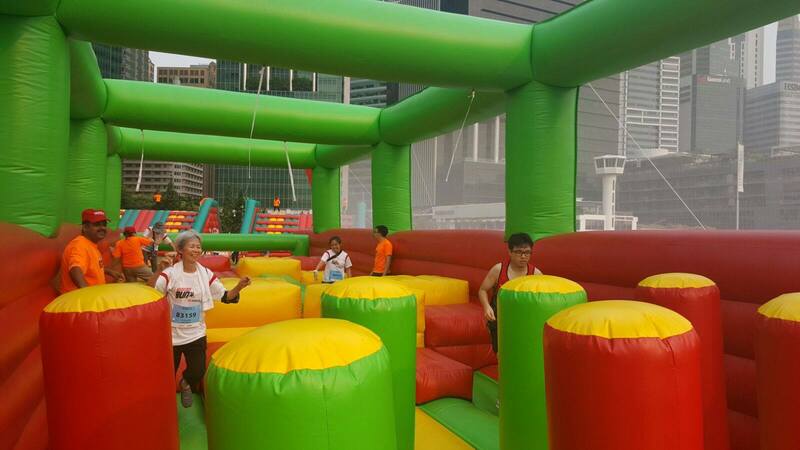 More importantly, I enjoyed this 5km fun run very much, particularly reliving my childhood when scaling the inflatable obstacles! With my knee braced, I was well protected for this run. Although it was just a short run; a distance to most army boys is a walk in the park, it did prove to me that my injury is recovering well. When will I be ready to run the half marathon again? I cannot say for sure. Being a conservative runner that I am, I rather play it safe and let my knee recuperate fully for the next few months before attempting anything more than 10km. While I make this journey to recovery, I am also celebrating my new discovery of the joy of running. During my 4 months of recuperation from the injury, I learned other lessons about being a runner. I am slowly making my way back to regular running again; but I am now approaching running very differently. How an injury can cause a mindset change for a runner? This sounds like a good theme for the next blog; maybe I will consider that. Meanwhile, EVERYONE, run safe and celebrate each milestone of your running journey.